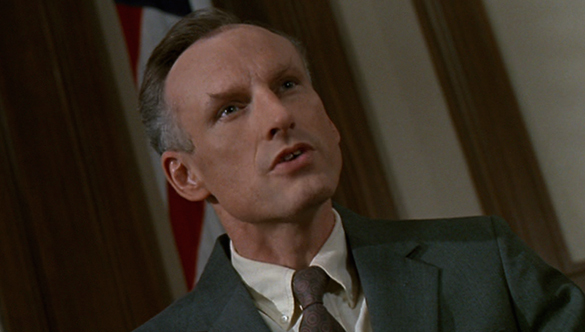 James Rebhorn made a career of playing entitled WASPs. But he didn’t just play them, he perfected the persona, embedding himself within modern cinema in the process. When Rebhorn passed away from skin cancer last week (read his beautiful self-penned obituary here), we lost one of the most legendary character actors who has ever graced the screen. While some may not have known his name, there isn’t a single fan of film who wasn’t touched by Rebhorn’s craft. He appeared in so many films, often playing elitist, unlikeable men to amusing results. Thing was, rarely did you dislike Rebhorn’s characters from the onset. Rebhorn always gave them humanity, a sort of two-faced kindness that helped conceal the intentions of his characters. Despite the characters he played, it was obvious that James Rebhorn was one of the good ones. A genuine, regular fella who loved being in the game. I’ll miss him greatly, but so appreciate the plentiful work he’s left with us. Most every mega action blockbuster has a character like Secretary of Defense Albert Nimziki. He’s the common enemy on the ground; the guy we all love to hate. The way Nimziki manages to constantly defy the President and put his own agenda before everyone else is simply hilarious. When Nimziki is ultimately fired, we want to cheer as loudly as Randy Quaid blowing that spaceship to hell. What makes Independence Day so much fun is that it never really takes itself too seriously. It’s always aware of its kitsch absurdity, and embraces genuine humor whenever it arrives. Take the film’s best use of levity, as the newly-fired Nimziki joins a Jewish prayer group moments before certain death. “I’m not Jewish,” Rebhorn says. “Nobody’s perfect,” Judd Hirsch barks back, borrowing one of cinema’s most iconic lines. It shouldn’t work, but boy does it ever. 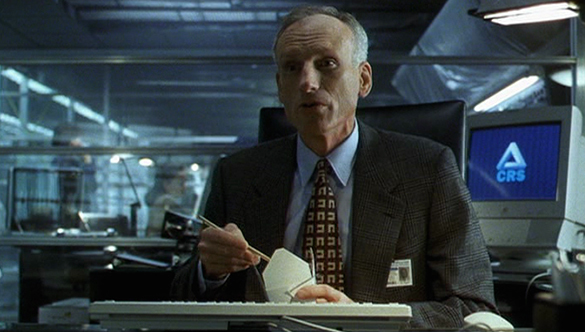 Rebhorn had one of the most important roles in David Fincher’s complex puzzle of a film, The Game. On a story level, his character was essentially tasked with setting up the whole film. He had to describe what the titular game is – how it works, why it benefits, what’s its purpose. Delivering tons of expository dialogue in such a short period of time is no easy feat. Thankfully, Rebhorn had great material to work with, but the skill it requires to deliver these lines in an interesting way should not be overlooked. Secondly, and more interestingly, Jim Feingold is first person in the film who has to deflate the massive ego of Michael Douglas’ character, Nicholas Van Orton. This includes everything from Jim asking Nicholas to hold his Chinese take-out, to Nicholas going through hours and hours of testing to prep for The Game. There’s a drabness to Jim Feingold that feels wholly authentic. The whole idea of The Game is such a unique and eerie concept, and then you have this Feingold guy explaining it to you with the indifference of describing how to separate whites from colors in your laundry. Rebhorn gives The Game the proper set-up it deserves, and from then on, there’s no looking back. Believing Tom Ripley is an old friend of his son, Dickie, Herbert Greenleaf hires Tom to travel to Italy to convince Dickie to return to the States. In this opening scene, we get a pretty good sense of who Herbert is. Rich, authoritative, and somewhat embarrassed by his son’s extravagant lifestyle. But it’s much later in the film that we realize what Herbert is really all about. As Herbert is talking to Tom about the disappearance (and presumed death) of Dickie, he suddenly unleashes a quick and ferocious monologue of parental contempt. He lashes out at his son, even thought Dickie is nowhere in sight. 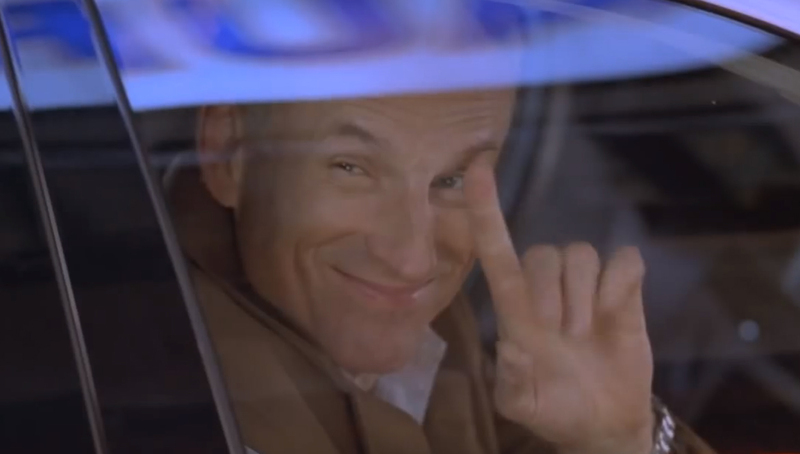 In one of his few out-and-out comedic performances, James Rebhorn proved an excellent wingman to Robert De Niro’s Jack Barnes in Meet the Parents. Larry’s constant, almost hidden sarcastic digs against Greg (Ben Stiller) make a great counter attack to Jack’s more direct approach. Whether Larry is making fun on Greg’s sleeping habits, his lack of skills in water volleyball, or his choice of car, most everything Larry says is to further instill shame and insecurity within Greg. Rebhorn was a master at injecting humor into his otherwise serious performances, but with Meet the Parents, he went for the broad comedy laugh by playing it straight. Rebhorn’s work here is a skillful balance between farce and understated humor. Playing one or the other is routine; finding the balance is significant. 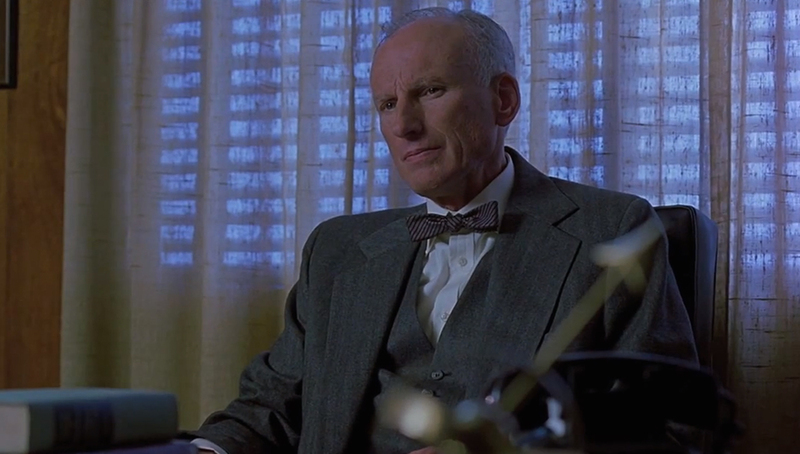 Rebhorn isn’t in Far From Heaven for very long, but his scenes in the film are deeply unsettling. Rebhorn plays the doctor who is going to “cure” Frank Whitaker’s sexuality. During his initial consultation on the matter, Frank (a desperate and excellent Dennis Quaid), sits nervously as Dr. Bowman goes through the treatment procedure. If extensive psychotherapy doesn’t work, they may have to resort for electroshock treatment or hormone injections. What’s so disturbing about this scene is how matter of fact Rebhorn plays it. Sure, one might argue that in ‘50s Connecticut, this school of thought could be normal, even for a medical professional. But there’s an indifference to Rebhorn’s voice that, by today’s standards, is simply chilling. 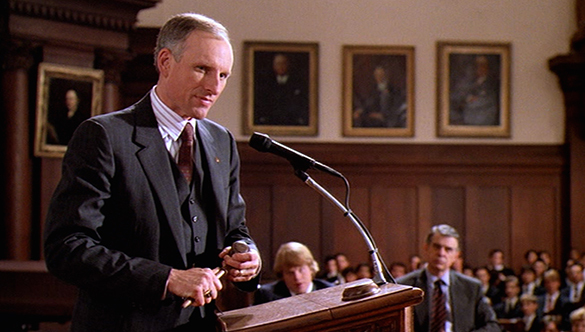 The apex of the trademark James Rebhorn WASP persona came in the form of prep school headmaster Mr. Trask. After Trask is the victim of a messy prank, he zeroes in on Charlie Simms (Chris O’Donnell) to feed him information. In addition to witnessing the prank, Charlie is one of the few kids at his New England prep school whose doesn’t come from money. He has no wealthy father to defend him, no grand sense of entitlement to assert his dominance. Knowing this, Trask preys on Charlie’s weakness. In the film’s most famous scene, Trask leads proceedings in front of the entire student body in an effort to get Charlie and/or another witness, George (Philip Seymour Hoffman) to divulge information about the prank. Trask lets George off easy (presumably because his daddy has dough), but goes to task on Charlie. Charlie’s new friend, Lt. Col. Frank Slade (Al Pacino) is having none of it, and engages in a fiery verbal battle with Trask in front of everyone. 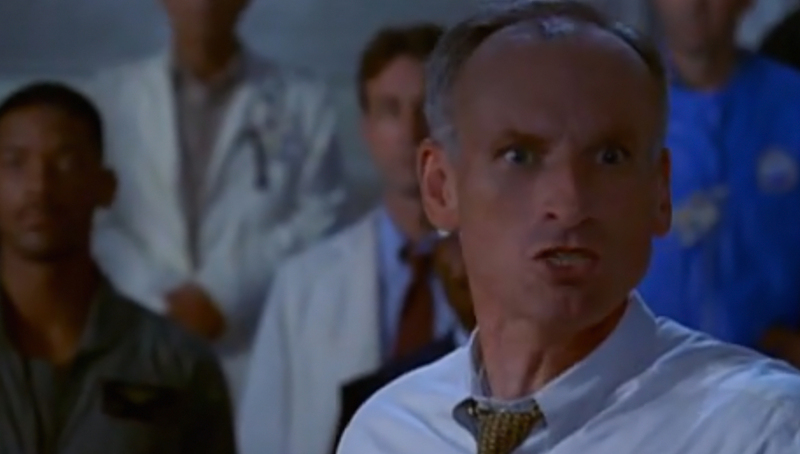 I remain deeply saddened by the loss and James Rebhorn, but when I watched this scene last night, I couldn’t help but smile at Rebhorn’s performance. The way he’s constantly banging that goddamn gavel and bullying Charlie into speaking… it’s just so priceless. Pacino has the showier role here, but for my money, the best line of the film is James Rebhorn being put into place by his board members, and muttering, “Very well,” under his breath as he concludes his portion of the proceedings. Very well, fine sir. Very well, indeed. Truly one of the great character actors and he will be missed. He played those dickhead roles perfectly yet also made them funny. I read his obituary and that took balls to write something so eloquent and so endearing without the need to pat himself in the back while thanking others who had been there for him. He will be missed. That scene in Scent of a Woman is classic as it's definitely his crowning achievement. Definitely man. Such an immense and important talent for film and TV. Happy to hear that we agree on Scent of a Woman as his best. But really, this guy was good in everything. RIP Mr Rebhorn. I saw him in so many films but didn't realize his massive filmography. He's truly one of Hollywood's great character actors. Great spotlight here, Alex! Thanks Ruth! His filmography is nuts; all kinds of films in all kinds of genres. And Rebhorn was always on point, no matter what. Definitely one of our great character actors. He's one of those people who's in a ton of films, but never really tries to take the attention away from the star. I've seen all six of those films, but I honestly didn't remember Rebhorn in any but Independence Day. Maybe it's because he was so hissably evil in that that he stands out to this day. He really does stand out in that film. "Hissably evil" is such a great way to put it. Happy to hear that you were a fan of his work. What a remarkable man and extraordinary actor. I never had the pleasure to work with him but knew many who did. He was very well thought of and apparently had an amazing sense of humor---kept the set of "Meet the Parents" in stitches during his time on the set. So sad to see another gifted character actor leaving us too soon. Very, very sad. I love hearing that he had such a great sense of humor. He really seemed like a good guy, you know? 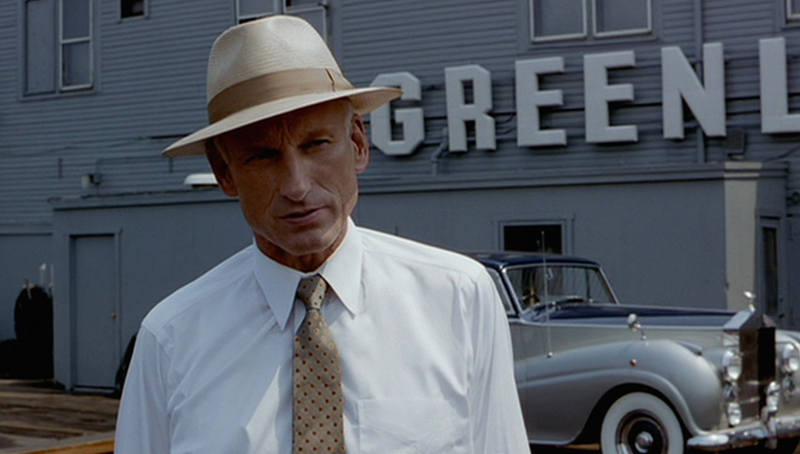 I'm glad to see you spotlighting James Rebhorn, who's given so many good supporting performances over the years. The one that stands out to me is his part in the HBO miniseries From the Earth to the Moon as Harrison Storms. That brings out the best in him and shows a lot of heart too. You know, I still haven't watched all of From the Earth to the Moon. Only saw the first episode years ago, but I've always wanted to revisit it. I'd definitely watch it all to see some more of Rebhorn's work. Excellent post! He was one of the finest character actors in the business. I'm so glad you chose his performance in Scent of a Woman as the best. He plays it perfectly. I've been meaning to rewatch The Talented Mr. Ripley for over a year, so I'll have to give it another look soon. Thanks man! I was actually stunned how vital his character is in Mr. Ripley when I rewatched it. Had completely forgotten. But man, he really goes all in there.